Thank you caregivers and certified nursing aides for your hard work and caring for our seniors. Senior care training assists caregivers to better manage a senior's care needs and manage caregiver stress. 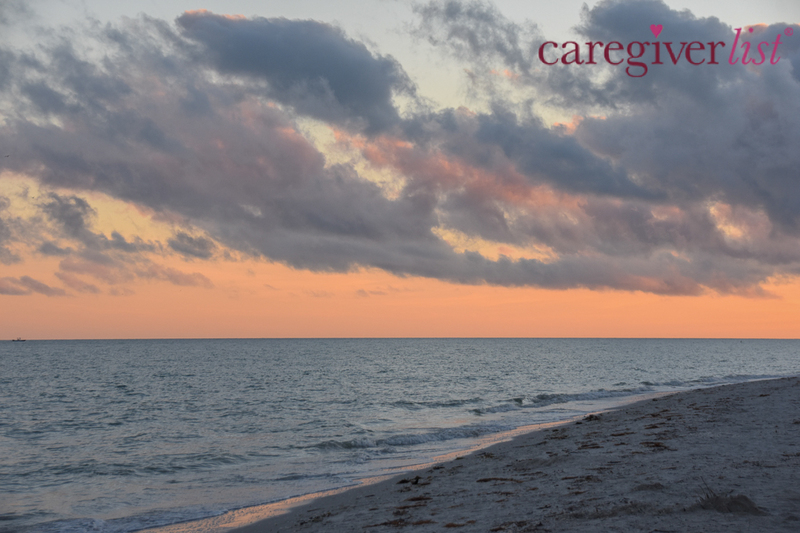 This week's stress relief photo was taken at sunset on Sanibel Island in Florida, on a perfect evening for a walk on the beach. Please enjoy and feel free to share the photo and inspirational quote with loved ones. We hope you have a great week. "Do not forget little kindnesses and do not remember small faults." How do you become a professional senior caregiver? Training to learn professional senior caregiving skills and to comply with state requirements for caregiver training is one of the first steps. Join the Professional Association of Caregivers to receive online caregiver training and more. Become a professional senior caregiver by joining the Professional Association of Caregivers to receive online caregiver training, t-shirt and lapel pin to become a senior caregiver in one of the fastest growing industries in America. Join the P.A.C. Caregivers now must have certified training meeting state guidelines in many states, to enable the caregiver to provide high quality care and to protect both the senior and the caregiver. Caregiver training will include basic caregiving skills along with how to manage for emergencies and understand signs of elder abuse (and how to report....because elder abuse very frequently involves a family member as the abuser and caregivers are in a unique position to recognize and report). How do you become a senior caregiver? As long as you naturally have a caring personality and an appreciation for the aging journey seniors are dealing with (a journey we all hope to be fortunate enough to make someday), then you just need to educate yourself on some proven skills that make caregiving a positive experience for both the senior and the caregiver. 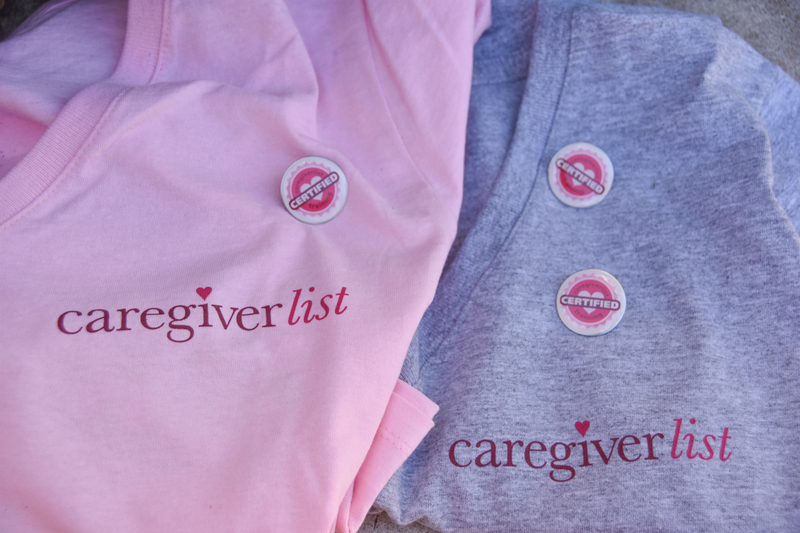 The Professional Association of Caregivers assists you to learn the basic caregiving skills with an online course while keeping up with senior care industry news and you'll receive a t-shirt and lapel pin along with the training. You may also apply for a caregiving job on Caregiverlist to begin working as a companion caregiver. More senior caregivers are needed as America's seniors are living longer, while requiring some care services for at least a few of their "oldest old' years. Those are the years over age 85 where all of us will experience a decline in abilities as part of the natural aging process where cells stop regenerating. Caregiving requires skills and with the proper training you can then begin working as a professional caregiver to fill part-time and full-time jobs during weekdays and weekends. Become a senior caregiver by taking an online caregiver training course meeting the state requirements for states with established guidelines for caregiver training and apply for a senior caregiving job to be considered for positions in your area. California caregiver training began in January of this year requiring 10 hours of training for new caregivers. Certified caregiver training is now required in California as well as many other states in the U.S.A. California's state legislature passed the Caliofornia Home Care Services Consumer Protection law which basically just enforces all the requirements senior care companies were providing with the addition of requiring California caregivers to have 10 hours of caregiver certification training. California's Assembly Bill 1217, often called "AB1217" outlines the caregiver training requirements. After the first year of working as a caregiver, senior caregivers must document they have taken 5 hours of additional training each year to maintain caregiver certification for the state of California. By taking an online training course, caregivers can easily document their training. View the video below to understand the training certification and join the professional association of caregivers to keep your training updated each year. Get started with California Caregiver Training here. Certified Nursing Aides provide the hands-on care for seniors and others needing care in hospitals, nursing homes and assisted living communities. In the U.S.A., federal legislation was passed to mandate a minimum of 75 hours of training through an approved school for nursing aides to qualify to take the state certification exam to become a Certified Nursing Aide. States can mandate additional hours for training which is why some states require 150 hours of study or more before an individual may take the nursing aide certification test. Request C.N.A. Class Admissions packets for schools in your area and explore becoming a C.N.A. as there are ongoing job openings in this field. As more than 10,000 Americans turn age 65 each day and our seniors are living longer lives than previous generations, more qualified nursing aides are needed. You may also apply for a companion caregiver job while you are pursuing C.N.A. training as the only requirements are to have a caring and dependable personality. Senior care companies hire between 5 and 10 caregivers each week to keep up with staffing demands as seniors do not plan ahead for senior care. Senior care companies provide caregiver training and you may also take online caregiver training to become certified as a professional caregiver. How Do I Become a C.N.A. in California? What Do you Have to Do to Become a C.N.A.? Find Certified Nursing Aide programs or go to Caregiverlist’s C.N.A school directory to research the requirements for acceptance into a program. The average California C.N.A. school cost is $1,320 and only schools with approved programs by the California state health department may offer the nursing aide certification training. California requires that Certified Nursing Assistant complete a minimum of 160 training hours before taking the certification exam. This is made up of 100 hours of practical training and 60 hours of in-class coursework. Once the coursework and training hours are complete, passing the state-approved C.N.A. certification exam is your last step before becoming a certified nursing assistant. Consider taking a C.N.A. practice test to refresh your nursing aide knowledge and to review the types of questions presented on the exam. Senior care companies, assisted living communities, nursing facilities, and hospitals are always looking to hire certified nursing assistants. Fill out our job application to apply to all C.N.A. and caregiver jobs near you. Furthering your skillset is an important factor to a successful healthcare career. Buy a certified digital caregiver training course that complies with the 10 hours of training mandated by California state law. The average C.N.A. salary in California is $14.96 per hour and is projected to growth 18% over the next 10 years. This is because as the baby-boomer population ages, more C.N.A.’s will be needed in long -term care facilities. Begin your healthcare career by receiving a free C.N.A. 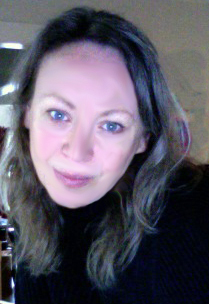 class application or by purchasing Caregiverlist’s digital caregiver training.